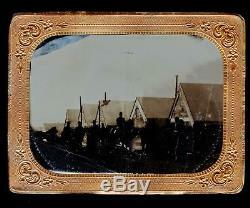 Scarce 1/4th Plate Tintype Outdoor Civil War Camp Scene with soldiers with one on horse back. Quite the unusual scene & composition. Almost makes me think it was taken in the early morning. CONDITION: Image is in good antique condition with a vertical bend and some surface wear. Comes with mat, glass & preserver but no case. Make sure to check out my other great photo auctions and listings in my store! The item "Rare 4th Plate Outdoor Tintype Civil War Camp Scene Soldiers One On Horse Back" is in sale since Monday, December 04, 2017. This item is in the category "Collectibles\Photographic Images\Vintage & Antique (Pre-1940)\Tintypes". The seller is "blackflagvintage" and is located in Dearborn Heights, Michigan. This item can be shipped to United States, Canada, United Kingdom, Denmark, Romania, Slovakia, Bulgaria, Czech republic, Finland, Hungary, Latvia, Lithuania, Malta, Estonia, Australia, Greece, Portugal, Cyprus, Slovenia, Japan, China, Sweden, South Korea, Indonesia, Taiwan, South africa, Thailand, Belgium, France, Hong Kong, Ireland, Netherlands, Poland, Spain, Italy, Germany, Austria, Russian federation, Israel, Mexico, New Zealand, Singapore, Switzerland, Norway, Saudi arabia, United arab emirates, Qatar, Kuwait, Bahrain, Croatia, Malaysia, Brazil, Colombia, Panama, Jamaica.